The muscles that help to bend the wrist and fingers are called flexor muscles. These muscles form tendons and get attached at the elbow level. When you develop Golfer’s elbow, it becomes painful and inflamed at the attachment point on the inner elbow. Golfer’s elbow tends to occur after a period of repeated overuse. The bone of your elbow is like a boney bump at the end of the bone where the muscles get attached. Golfer’s elbow may be acute or chronic. Generally when it is acute, there will be pain, swelling, redness and warmth. Some of the symptoms involve pain in the elbow that spreads up or down the forearm. You may also feel weakness in the forearm. Pain may start suddenly or develop gradually over time. Treatment varies depending on the stage of inflammation. The best way to reduce the problem is to treat the symptoms with Registered physiotherapy. A good physiotherapy treatment program should begin with pain reduction. This can include ultrasound, laser, interferential treatment, acupuncture, and/or registered massage therapy. Sports taping can be used as an option. Physiotherapy treatment should include briefly reducing the activities that caused the pain. Physiotherapy treatment for Golfer’s elbow should also include a proper brace such as the “Bandit” brace that takes the pressure off the injured tissues. The “HAWK” tool is another option. It can be used to break down any scar tissue that has developed. This speeds up the healing time! The final stage of physiotherapy treatment should include strengthening the forearm muscles, and showing you stretches to do prior to activities. 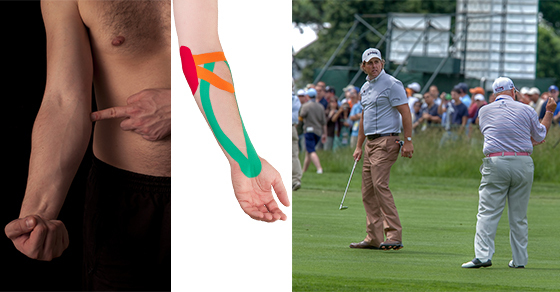 PhysioNow provides full physiotherapy programming to treat Golfer’s elbow at both Mississauga locations.